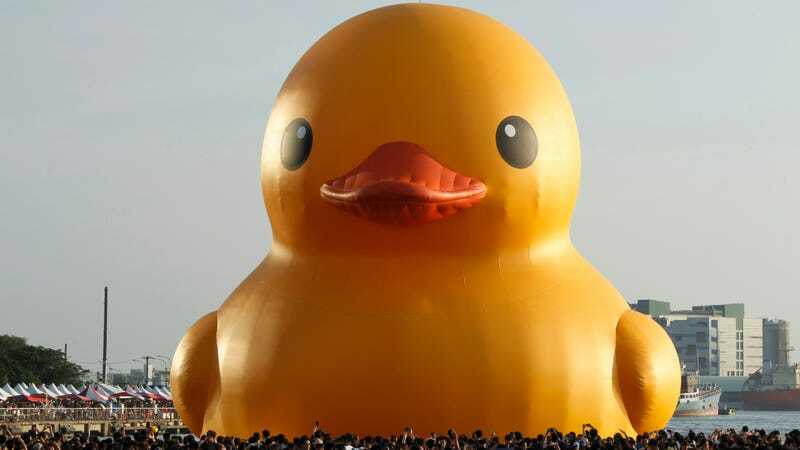 A giant rubber duck in Kaohsiung, Taiwan, in 2013. That’s the conclusion of a recent study by a research team from the Swiss Federal Institute of Aquatic Science and Technology, ETH Zurich, and the University of Illinois published this week in the journal N.P.J. Biofilms and Microbiomes, per the New York Times. The researchers wrote they collected “19 real bath toys (e.g., rubber ducks) from five different Swiss households” and then compared them to a control group, eventually concluding that the real bath toys had up to 75 million bacterial cells per square centimeter of interior surface. ... Bath toys are typically used by children, who are potentially sensitive and vulnerable users. Squeezing water with chunks of biofilm into their faces (which is not unexpected behavior for these users) may result in eye, ear, wound or even gastro-intestinal tract infections. To assess the real extent of this risk, more experimental work with specific focus on hygienic aspects is needed. Given that one of the recommendations given by the researchers is to boil rubber duckies after use, it may simply be easier to just avoid them entirely. The research team noted that simply cleaning the ducks is not enough, because the surviving bacteria tends to be stronger. In any case, this makes all those giant rubber ducks sometimes floated out into the rivers of major cities all the more ominous. Spare us, oh avatars of pestilence, for we know not what we have summoned!